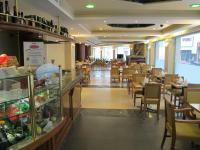 Located right across from Psaropoula Beach, Hotel Africa offers free Wi-Fi access in public areas, and a buffet breakfast. The Old Town of Rhodes with the Knights' Castle is a 15-minute walk. The Hollytree Hotel is located in Kentallen, Scotland, on Loch Linnhe. Castle Stalker is four miles away, and Cuil Bay five miles away. Hotel Features. This family run hotel is set in gardens at the foot of a hill, and offers views over Loch Linnhe and the Argyll mountains from a private pier. The hotel offers a heated indoor pool, and a Finnish sauna. Wireless Internet access is available, and parking is complimentary. Menzies Pinewood is a modern hotel situated in gardens in the Cheshire countryside, three miles from Manchester Airport and eight miles from the Manchester city centre. This three floor hotel features 58 guestrooms, all of which are decorated in tones of blue and white and include satellite television with pay movies, Internet connections, telephones, trouser presses and hair dryers. Extended Stay America was designed specifically for the Road Warriors the long term, value conscious traveler. If you are a Road Warrior, you need more than a place to stay when you are away from home, you need a place to live, and this is the place] On site amenities include 24 hour coin operated guest laundry facilities, iron and ironing board available for use at the front desk, safety deposit boxes, and luggage carts. This beachfront aparthotel in Porto Santo is 4 km from Vila Baleira's centre. It has an outdoor pool with Atlantic Ocean views and apartments with a balcony. Free parking is available. In the heart of Bayswater, Berjaya Eden Park London offers elegant 19th-century architecture and charming accommodation, close to Kensington Gardens and Hyde Park. 2 Tube stations are just a 2-minute walk away. Situated on vibrant South Bank, Think Tower Bridge is just a 10-minute walk from the Tower of London. The bright and stylish apartments have free Wi-Fi and modern kitchens. The contemporary apartments feature bare wooden floors and modern art. This 3-star cliff-top hotel overlooks Cromer Beach, and all its rooms have a sea view. Fine cuisine is offered in the à la carte restaurant, and the popular bistro serves fresh fish. Just 500 metres from lively Oxford Street, Flexistay Central Serviced Apartments are a 10-minute walk from the British Museum. They feature modern decor and free Wi-Fi. The George Hotel is located in the centre of Reading, England, opposite the Oracle Centre and 100 metres from the Riverside shopping and nightlife district. Reading train station is within one mile of the hotel. Hotel Features. The four floor George Hotel occupies one of Reading's oldest buildings, a 15th century former coaching inn. The 18th and 19th century façades overlook a cobblestone courtyard. The Black Bull Hotel is a 17th Century Inn standing in the main street of Wooler.It still retains much of its original character & is situated in one of the most picturesque parts of Northumberland. On the A90 and with easy access to the very heart of Aberdeen's city centre, the hotel offers great value, with free parking and spacious, comfortable and modern en suite rooms. The Premier Inn Aberdeen Central West has a 24-hour reception desk. Formerly a 15th century water mill, the Ramada Perth hotel is set in the centre of Perth, two miles from the scenic Cherrybank Gardens. All 76 guestrooms are spread across three floors and provide satellite TV, complimentary coffee, trouser presses and hair dryers. Loch Fyne Hotel & Spa is housed in a fine 19th century converted Scottish property with modern additions. It is located on the shores of beautiful Loch Fyne, four miles from The Folk Museum. Glasgow International Airport is 55 miles distance, an approximate driving time of 85 minutes. Hotel Features. The hotel has an indoor swimming pool, and spa facilities include a sauna, a steam room, and an outdoor hot tub. Set in Ta' Xbiex, Florida Mansions offers self-catering apartments a 15-minute drive from Valletta Marina. Xbiex Bus Stop is 200 metres from the property. Located 100 metres from the seafront in Sliema, Park Hotel offers views across to Malta's capital, Valletta. It features a summer rooftop pool plus an indoor pool with a hydromassage tub. Situated on the edge of North Dartmoor between Tavistock and Okehampton, this family-run hotel with à la carte restaurant is open all year round. The mirrored glass Copthorne Hotel Slough Windsor rises seven stories above Slough, United Kingdom, only three kilometers from Windsor Castle. Legoland theme park stands eight kilometers away from the hotel while Thorpe Park, London's popular amusement park, is located sixteen kilometers from the hotel. 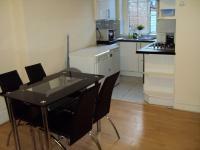 The property is located 13 kilometers from London Heathrow Airport. Hotel Features. Situated in Newport, just off junction 24 of the M4, this contemporary-style hotel provides 119 well-appointed rooms in a welcoming environment, just a 30-minute drive from Bristol and Cardiff. Situated right at the heart of Nicosia, Castelli offers peaceful and well-appointed accommodation with free Wi-Fi throughout. It features a restaurant and provides complimentary parking on site. 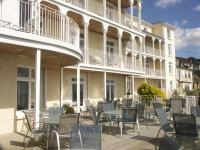 The Paramount Imperial Torquay Hotel is located in Torquay, England, on a cliff top overlooking the sea. The centre of Torquay, known as the capital of the British Riviera, is less than two miles away. Hotel Features. A grand resort style hotel surrounded by the natural beauty of the Devon coastline, the Barceló Imperial has a domed lobby furnished with antiques, including a grandfather clock, and dominated by a huge chandelier. Set in tropical gardens overlooking the Funchale's Atlantic Ocean, Eden Mar features a lagoon-style outdoor pool. On-site amenities include a tennis court and a spa with jacuzzi, hammam and massage facilities. On a cliff in Caniço, this 4-star boutique hotel features 2 swimming pools and a spa. Part of the natural underwater reserve of Madeira Caniço de Baixo, it has a diving base and a variety of courses. Offering a private outdoor pool, a sun terrace and a furnished patio with BBQ, Penmon Farmhouse is a villa in the countryside around Gharb, on the island of Gozo. Wi-Fi is free throughout. Hotelyear built 1997 year remodeled 2006additional property description the best western hotel grauholz is a three star hotel situated outside of bern at the motorway a1. although situated next to the motorway, it is a safe oasis of relaxation near the forest, with many possibilities to explore the region. the restaurant is only a few minutes away an offers varied and seasonal meals. The Windward Hotel is located in Newquay, England, one mile from Watergate Bay and three miles from Newquay Zoo and the Blue Reef Aquarium. Distance to the nearest train station is two miles and Newquay Airport is three miles away. Hotel Features. Situated on the north Cornwall coast, The Windward is a boutique hotel with panoramic views of Porth Bay. Offering warm Cretan hospitality, just 25 kilometres east of Heraklion city, in Hersonissos, Central Hersonissos Hotel is a family run hotel 200 metres from the beach and 300 metres from the town. Gozo Break Farmhouses offers elegant and rustic villas, each with a private pool and garden. Set in the villages of Kercem and San Lawrenz, they are approximately 5 minutes by car from Victoria's centre. In the heart of central London, Wigmore Court Hotel is a family-run Georgian property offering good value accommodation, just a 3-minute walk from Oxford Street Underground Station. The modern five floor Marriott Heathrow Windsor features contemporary architecture and is situated 6.5 kilometres from Heathrow Airport and 20 kilometres from London. 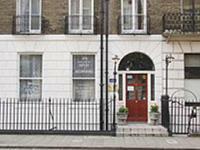 Windsor Castle is four kilometres from the hotel and Legoland is eight kilometres away. 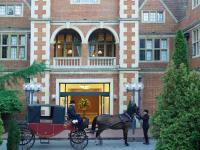 Langley railway station is two kilometres from the hotel and London Heathrow Airport is 6.5 kilometres away, with an approximate driving time of 15 minutes. Hotel Features. Savill court is a jacobean mansion set at the end of a rhodedendron lined driveway. with red and white brickwork, leaded mullion windows and tall twisted chimneys rising over the sweeping lawns and gracious cedar trees this is no ordinary hotel. a gbp 12 million refurbishment program has transformed the interior into a supremely elegant setting. it appeals to leisure and business guests in equal measure. 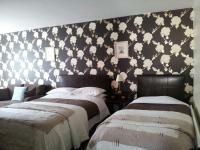 Carmelite is a boutique hotel with free Wi-Fi, and is close to Aberdeen Train Station. It has a stylish bar and restaurant with relaxing sofas, cocktails and good food. The hotel and bar are well-located for Aberdeen town centre and nightlife. The London Marriott Hotel Kensington is housed in a striking, eight storey modern building, located 800 metres from Kensington High Street and half a mile from Hyde Park. The 216 air conditioned guestrooms feature colourful contemporary decor with light oak furniture and are all equipped with telephones, satellite television with Internet connections, video game consoles, high speed data ports, minibars, coffee/tea makers and safes. Situated right on a private beach on Ixia Bay in Rhodes, 5-star Miramare Park features a seafront pool and a tennis court. Rooms have balconies or patios overlooking the Aegean Sea or the fragrant gardens. The Hilton Dartford Bridge is a modern, red brick hotel set just off the M25, one junction from Bluewater shopping centre and 25 miles from central London. This five floor hotel features 178 air conditioned guestrooms with bright, modern decor and contemporary furnishings; all include satellite TV with pay movies, hair dryers and tea and coffee making facilities.